Together with curator Kim McAleese, Underverk presented a set of feminist film screenings punctuated by food provided by meal ecologist Ayhan Aydin and experience designer Josefin Vargö, who translated certain elements from the film into taste. A set of food snacks were presented during Underverk’s feminist film screenings, co-curated together with Kim McAleese. For each film certain elements were translated into taste and interaction. Produced together with meal ecologist Ayhan Aydin. Film 1: La Blanchisseuse, Rohesia Hamilton, 1993. An experimental video examining the emotional and aesthetic underpinnings of the tendency that still exists for women to take a greater responsibility than men for domestic work and nurturing. The images of a woman ironing pay homage in their composition to paintings of laundresses by such artists as Edgar Degas, Honor, Daumier, Edouard Manet, Henri de Toulouse-Lautrec and others. Many of the paintings of laundresses by these artists create an ambiguously gentle impression, portraying the task of laundry as sensual, feminine, and producing contentment. La Blanchisseuse examines the relationship between the images with which we have grown up and the expectations women place upon themselves. Equally poignant texts; from Intrusion (Denise Levertov), Snapshots of a Daughter-in-Law (Adrienne Rich), and To The Lighthouse (Virginia Woolfe) scroll over the images, alluding both to the pull of tradition for a woman to provide nurturing care to others and to the sense of betrayal and rejection that can be the reward for providing such care. FOOD ACCOMPANIMENT: Steamed dumplings, filled with foraged greens, served in linens on an ironing board. The texture is very soft, while the taste goes from subtle to bitter tones to resemble the conflict of domestic labour. In this performance Rosler takes on the role of an apron-clad housewife and parodies the television cooking demonstrations popularized by Julia Child in the 1960s. Standing in a kitchen, surrounded by refrigerator, table, and stove, she moves through the alphabet from A to Z, assigning a letter to the various tools found in this domestic space. Wielding knives, a nutcracker, and a rolling pin, she warms to her task, her gestures sharply punctuating the rage and frustration of oppressive women’s roles. FOOD ACCOMPANIMENT: ‘Semiotics of a carrot’; X small carrot cubes, Y dried purple carrots, Z carrot caramels, showing the value of an ingredient. This was shared on a long wooden board, between 3-4 people. FIlm 3: Our Time Is Coming, Selma James, 1971. Selma James, a socialist and feminist, uses her own experiences working in low-paid jobs and being a mother and housewife as a starting point in this investigation into whether women are exploited in all areas of society. Interviews with full-time housewives, and with females who work outside the home but still do almost all of the household chores, reveal the true extent of women’s work. James goes on to ask whether equal pay outside the home and a real division of housework between men and women will ever become a reality. In 1972, a year after this programme was broadcast, a key work by Selma James, Power of Women and the Subversion of the Community, was published. In this, she expands on the ideas put forward in the programme and argues that the entire labour market is built upon the unpaid work of women. Also in 1972, James set up the International Wages for Housework Campaign, which argues that running the home should be recognised as work in official statistics and that people doing this labour should be paid a wage by the government. FOOD ACCOMPANIMENT: A big pot with a miso-dashi soup, served in paper mugs. They will huddle around two small bonfires, the perfect environment to create a communal feeling for discussions and opinions. Supported by Stockholms Stad and CuratorLab Konstfack. Together with curator Kim McAleese, Underverk presents a set of feminist film screenings punctuated by food provided by meal ecologist Ayhan Aydin and experience designer Josefin Vargö, who have translated certain elements from the film into taste. In this film programme, the artists explore domestic issues such as motherhood, familial relationships, control of physical space and the preparation and consumption of food. 20:00-20:30 — Course 1: Blanchisseuse, a steamed introduction. 20:40-20:50 — Course 2: Semiotics of the Carrot, the value of an ingredient. 21:00-22:00 — Course 3: Our time is coming, communal soup experience. Limited food, available on first come, first served basis. Ayhan Aydin (Meal Ecologist) works interdisciplinary with how the food system as a whole functions. Aydin integrates social sciences, natural sciences, food craftsmanship and practical farming. Ayhan has previously participated in the projects Restaurant roam (Parkteatern), Fittja Open (Botkyrka Konsthall), Nordic Sound Bite (New Nordic Food). In the three different projects, food has been a central and fundamental part of the story. In Konsthall C’s kitchen, together with curator Kim McAleese, Underverk invited commercial ‘chef’ and a domestic ‘cook’ to respond to the questions posed in the Mierle Laderman Ukeles’ Manifesto for Maintenance Art. Produced in 1969, the manifesto connected to other feminist activities around the world which began to articulate the gendered inequities between paid and unpaid labour. 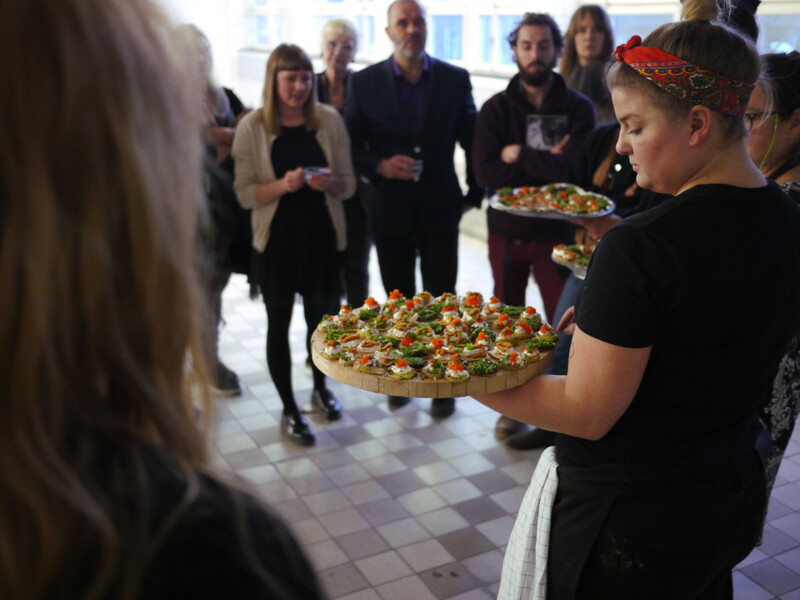 The chefs Josefin Günther and Magdalena Günther were invited to make a dinner, using the food as their material to convey what they believe to be ‘maintenance work’ as an attempt to readdress the issues raised in Ukeles manifesto. The dinner was part of the public program of the Ukeles exhibition at Konsthall C, the idea being that members of the public are invited to engage in some of her thoughts and artistic concepts over a meal in the space. Josefin Günther is a sommelier currently working as a freelance writer. Food, beverages, scents and flavours have always been a very big and natural part of her life and she is always looking to add new scents and flavours to her palate. Finding new ways of expressing what we experience when we eat and drink is an ongoing home-project of hers. Originally from Poland, Magdalena Günther came to Stockholm via Copenhagen where she attended a College of Arts. Her entire professional career as a graphic designer/art director has been spent trying to juggle work, family and social interactions. Her passion lies in exploring gastronomy and culture from other countries, and she has always cooked. For Season 5 Underverk collaborates with curator Kim McAleese and together we present a series of food events spanning April and May 2015, which will focus on home labour and the gender divide in relation to domestic tasks (such as cooking, cleaning and maintenance). The projects will ask whether much has changed -if anything at all- since the feminist protests of the early 1970s. The discussions and participation in the presented food events contribute a vital part of and act as the core material of the project’s research. The results and documentation will be presented in a printed matter acting as the final piece of the programme. In Konsthall C’s kitchen, an invited commercial ‘chef’ and a domestic ‘cook’ will respond to the questions posed in the Mierle Laderman Ukeles’ Manifesto for Maintenance Art. Produced in 1969, the manifesto connected to other feminist activities around the world which began to articulate the gendered inequities between paid and unpaid labour. The chefs Josefin Günther and Magdalena Günther are invited to make a dinner, using the food as their material to convey what they believe to be ‘maintenance work’ as an attempt to readdress the issues raised in Ukeles manifesto. The dinner is part of the public program of the Ukeles exhibition at Konsthall C, the idea being that members of the public are invited to engage in some of her thoughts and artistic concepts over a meal in the space. A set of feminist film screenings punctuate by food provided by meal ecologist Ayhan Aydin and experience designer Josefin Vargö, which is designed to create and host an environment to foster discussions. In this film programme, the artists explore domestic issues such as motherhood, sexuality, death, familial relationships, control of physical space and the preparation and consumption of food. We finish the season with a dinner to bring people together in a private and intimate setting to encourage an exchange of ideas regarding identity, work and activities in the domestic space. We invite a chef to lead the workshop and discussion. More information soon! On August 27 Pomme Van Hoof held an intergalactic travel advice installation on Mariatorget in Stockholm. By involving the public she offered an artisitc experience based on people’s choices. Pomme wanted us to “explore our cosmic neighborhood in our minds, allowing us to create our own imagery of how a journey into space might be like. You Are Here is developed under initiative of Museum of Architecture and Design (MAO) and the Biennial of Design (BIO50). The final version will be presented 18.09 – 07.12.2014 in Ljubljana Slovenia. If you haven’t already gotten your hands on our catalogue from Season 1 — Hemmet, give us a shout viahej@underverk.in and come pick up a free copy! Sense Lab is an exhibition form where people engage in sensory experiments that stimulate and awakens all our senses by using our smell, sight, sound, taste, touch and intuition in new combinations. Curated by Underverk showcasing work by Maja Frögård, Andrejs Ljunggren, Henrik Ljunggren, Jacob Stenman, Daphne Zuilhof, Cecilia Callander and Josefin Vargö. On April 5, Ayhan Aydin and Livia Prawitz, designed a unique meal experience at Kuben in Fittja. When we arrived to the parking lot outside Kuben, the first meal was served – barbecued right next to us. Inside Kuben, we got a message played from a speaker saying that we had to assemble the dinner table, which was a pile of old tyres and wooden debri. A great experience to share with a group of strangers. We all formed a special bond, and by the time of sitting down we all felt that we kind of knew each other a bit better. The music that accompanied the dinner, alongside the setting inside Kuben, created a mystical atmosphere! Ayhan Aydin and Livia Prawitz will design a unique meal experience as part of Underverk’s Season 2. Limited places, to join rsvp to hej@underverk.in before March 28th. Photo from Ayhan Aydin and Livia Prawitz. The glowing candy installation by Ami Izaki and Exotikdot.